Do you like the idea of cooking with a pressure cooker, but the thought of it makes you nervous? We’ve all heard the suburban horror stories about exploding pressure cookers. Today, we’re going to talk about a few safety tips that will afford you peace of mind. In all honesty, you shouldn’t worry too much. Modern pressure cookers are designed and manufactured with an abundance of safety features that ensure you won’t wind up with an explosion of spaghetti sauce all over your kitchen. For example, most pressure cookers nowadays have valves that automatically release excess pressure. 1. Don’t buy a used pressure cooker. 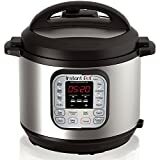 Buying items second hand is often an awesome method of saving money, but in the case of pressure cookers, it should be avoided. That old-timey pressure cooker you see at the flea market might seem quaint, but remember that older models often suffer from cracked gaskets and lids or ones that don’t fit properly. Depending on the age of the pressure cooker, it can be nigh unto impossible to find proper replacement parts. In this case, always buy new. 2. Make sure that you clean and store your pressure cooker properly. The recommended method of cleaning your pressure cooker is to wash the rubber gasket, lid, and pot by hand in warm, soapy water. Make sure to let it properly air dry before putting it away. Each time you clean it, you should always examine the safety valves to make sure that they are clean and free of obstructions. The recommended method of storing your pressure cooker is to place the lid upside down inside the pot. 3. Never overfill your pressure cooker. For most food items, you should never fill your pressure cooker more than two thirds full. This prevents the possibility that food will obstruct the steam vents. For foods like grains and beans, which often swell up as they cook, your pressure cooker should only be filled halfway. 4. Keep an eye out for steam. When you open your pressure cooker, or adjust the steam valve, expect plenty of steam to escape. To protect your hands, always keep dry pot holders on hand to use. It’s important to make sure that the potholders are dry. If they are wet, there is an increased chance that you could burn your hands. Don’t let any condensation drip on you, and make sure to open your pressure cooker with the lid facing away from you. Likewise, you should never hold your face too closely to the pressure cooker. 5. Learn how to time yourself. Learning how to safely use a pressure cooker is all about learning how to time your dishes. Remember that the cooking time a recipe gives is approximate, and it may be understated. It is always better to undercook your dishes rather than overcook them. If you need to cook your food for a longer period of time, do it in intervals of 3-5 minutes while under pressure. 6. Never use cooking oil with your pressure cooker. We all know that “the Colonel” did it, but this is actually a very dangerous practice. Even using a small amount of oil in your pressure cooker poses a hazard. There is a risk that it could explode or melt the gasket or other components of your pressure cooker. 7. Be extra vigilant when cooking frothy foods. When cooking foods that froth, like oatmeal or pasta, there is always a risk that the froth can rise to the point where it blocks pressure release vents and steam valves. When you do have to cook these types of foods, make sure that you are following a trusted recipe, and you should always fill the cooker well below the maximum fill line. These tips will help you use your pressure cooker to prepare delicious meals with success and safety. You should never be fearful of using modern pressure cookers. In fact, once you get the hang of it, you’ll be pleasantly surprised at just how enjoyable it is! Personally, I do not like to use oil in my pressure cookers. how do you rate the Power XL 10 quart?